If you’ve seen Inception then here’s our attempt to provide some sort of clarity to what happens. If you haven’t seen Inception, then do not enter! Spoilers reside here. Sorry, see it again. Level 1 IS Yusuf's dream. Fischer is just the subject. the dreamer IS the subject.. they enter a dream, the dream of the subject. he populates the dream with his stuff. the only reason that there is rain is because yusuf had to pee. he brought that in just like leo brings in mal and the train. the headphones have nothing to do with it. they are to synchronize the kicks. eames is a forger, so he can alter stuff in general. how can you even logically presume that they can enter arthur's/yusuf's/eames' dream WHILE IN fischer's dream??? that doesn't make any sense… it's levels of fischer's subconscious, that's the whole point. i don't understand how they can plant ideas in a person's mind (fischer) through someone elses dream (yusuf,arthur,eames), according to you. I use the logic of the film, not the logic of our reality. I'm only going from actual dialog in the film, not any conjecture from outside the film. See it again and listen for these things. hawks5999 a couple things to ponder on about this movie. >he just had a dream about people tampering with his mind and he decides to just forget about possible “dream thieves” in the plane? are we led to assume that he thinks the dream he just had is just a dream (that the dream thieves are something he fabricated while sleeping)? 2) how did fischer get into cobbs limbo dream without cobb entering it first or atleast the same time as him? 3) if cobb knew that if a person was killed he would go into limbo, how come he didnt create another level for that? he and ariadne were able to get into the same limbo dream as fischer (without killing themselves) so why didnt he just create a safe limbo (or something that isnt really as big. i would assume that the reason saito looked old in limbo is because it took him a while to find saito because of the size of the dream)? or maybe there is no point to having another level? because effect of the sedative was over…..
Actually, it wasn't Eames as Browning but Fischer's projection of Browning that Saito and Eames saw in the lobby level of the hotel. Once Mr. Charles fed the idea of Browning being in on the kidnapping, Fischer projected a Browning who acted as complicit to the kidnapping. Eames did need to forge Browning anymore because Fischer's subcon took over and forged Browning just as good. Amazingly, no Browning appears in the snow level so Fischer either didn't understand the rules of extraction or it's another goof all together. 1) He didn't immediately wake up. He had a week to hang out with Eames as Browning in the Van level before the sedative wore off. Eames, we can assume, told a good enough story to keep Fischer from thinking too hard about everything down below or when he woke up he just couldn't remember the levels 2 and 3. His subcon was trained for defense but probably not by someone with techniques like Cobb (ie using dreams within dreams). Remember Saito was impressed with the dream within dream technique from the beginning. “Ah Mr. Cobb, you live up to your reputation. A dream within a dream!” This leads me to believe that it was something that Cobb did but that maybe other extractors couldn't, wouldn't or didn't pull off. As for the waking up and seeing the machine, I doubt that happened. Remember back to the train at the beginning. Everyone came out of the dream at different times. They unhooked Saito but he didn't immediately wake up. In fact they all got away and likely off the train before Saito came too. Arthur is shown to be the one who wakes up immediately when the timer goes off. He likely disconnected and cleaned everything up before Fischer awoke. Cobb and Saito were last to awake from the sedative because they were the deepest in sleep. 2) Limbo didn't belong to Cobb. Limbo is a shared consciousness of all the dreamers. It would be barren and empty except for anything left in limbo from any of the dreamers who previously had been. In this group, only Cobb had previously been. So the remnants of what he and Mal had created were there… along with a projection of Mal herself. 3) Cobb had no expectation of anyone being killed so no need to build a safe limbo level if such a thing would exist. Arthur didn't do his research to find out that Fischer would have a militarized subcon defense. Arthur was too preoccupied with how to get a kiss from Ariadne (in my opinion) to do a qualty job. He was really sloppy on this mission. Cobb should have shot him in the airport after they landed IMHO. I don't think the size of Limbo was what kept Cobb from finding Saito for so long. It almost appears as if he washed up on the shore of Limbo at Saito's front door after dying in the van. Everything about limbo is speculation and none of the rules of limbo are hard and fast. Every reference to it in dialog has words like “possibly” or “maybe” or “worst case”. Nobody knows the rules of limbo, not the characters, nor the audience. holy sh!t AP, you need to watch the movie again. something for you to think about. when they tried to get in and steal info from Saito, how come Saito said when he woke up from the dream in the dream (where Mal killed Arthur) that he wasnt at his house because the rug is different. they then reveal that they were in the architects dream. idiot there was rain because when the van moved through pot holes on the road water splashed onto people who were dreaming, Yusuf didn't enter dream level beyond level 1. Remember that part where they say that they bring the subject into THEIR dream, and he fills it with his subconscious. Yeah, THEIR dreams, not his. Maybe you should consider watching the movie another time. no you are wrong. Cobb is so screwed up that his projections and angst are inserting themselves into the others dreams. I think that the deeper they go, the more pronounced they get. Its not always Mal but the images of his kids or the train in the middle of town. When is it ever implied, explained or shown that Cobb and Saito shoot themselves to get kicked out of Limbo? Nolan played fast and loose with that whole Limbo concept! At the end, Saito reaches for the gun after Cobb says let's be young men together. Then they wake up on the plane. technically, if cobb and saito shoot themselves at the table in order to get out of limbo, they both should fall into a further, 2nd level of limbo since their sedative in reality is still effective. there would be no way to get out of limbo without a 'kick' from reality (which is the plane scene). If there were a second level of limbo, I'd say you are right. But there is no concept of another level or limbo. It's implied that Limbo is the last stop. But as it is, you point out yet another internal inconsistency of the film. The more you dig into the logic, the more it falls apart. I think there is a reason this was a summer release vs. a fall or holiday release. If you don't think too much, it's all fascinating. Really scrutinize it and you discover that Nolan really did play fast and loose with Limbo as Shawne Anderson said. Or you could just say that Cobb was making up rules about Limbo but really had no idea what any of them were. Then we just have an unreliable narrator. Ariadne: Well, how long can we be stuck there? Yusuf: Decades. It could be infinite. I don't know. Ask him. He's the one who's been there. And they were ALL Fischer's dream, just different levels of his subconcious. They had to be in order to plant the idea and have him believe it was his own. Wrong. Cobb says specifically to Eames in the snow “this is your dream”. Arthur's dream is the hotel and Yusuf dreams the van. Watch for who gets the headphones placed on them to signal the coming kick. @AP and Shawne: The dreamers build the architecture and Fisher's subconscious fills the gaps, which is how Fischer's subconscious projected the attackers. The train and Mal were forced into the dreamworld by Leo's hostile subconscious. Normally, only the dreamer can create the architecture and the subject's subconscious creates people. However, Leo's hostile and guilt-ridden subconscious forces its way into the dreamworld of others. This is how he projects the train in the city, his children in the hotel and Mal in the snow fortress. Sorry, but the Architect creates the architecture of each level, not the dreamer. That's why they needed Ariadne in the first place. That's why she has to go to each of the three levels during the operation (again, Limbo is another story). Cobb explains this to her when they first meet and he enters the dream state with her. It's the intrusion of the Architect in the dreamer's subconscious that causes the hostile reaction of the people projected by the dreamer. When the team is all together for the first time and hatching the plan, Cobb explains why each level has to be Fischer's subconscious and therefore Fischer is the dreamer each time. At no time is Fischer the dreamer. He is the subject. I still wanna know where this infographic comes up with the idea that Cobb and Saito shoot themselves to be kicked out of limbo!? Saito likely shot Cobb and then shot himself. Saito reaches for the gun on the table after Cobb says let's be young men together. Hawk thanks for helping set people straight. It's a complicated movie, a lot of folks are a bit fuzzy on the details. It's our hope that the above infographic helps. 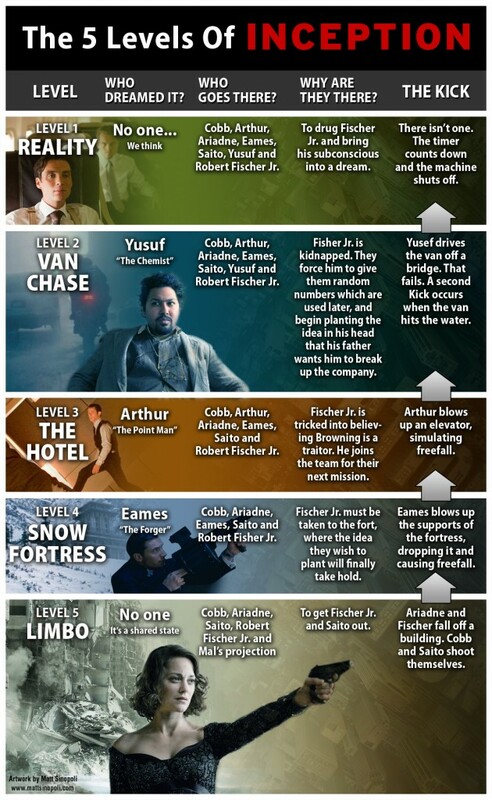 I agree with all the levels except for Limbo, Fischer went into a coma so effectively went into another dream (level 5) which hadn't been constructed by ariadne.this was unconstructed dreamspace but NOT LIMBO since you have to die to get there. Cobb and Ariadne follow him (without dying). Saito dies and goes to Limbo. Ariadne & Fischer kick out of the level 5 dream and move back up the levels. Cobb goes to limbo once he drowns in the van. This is why he is younger than Saito in Limbo. If Level 5 was Limbo he would have been older since he went there before Saito died. Limbo IS unconstructed dream space. If they had constructed 1 level and gone in sedated then death would take them to level 2 and it would be limbo. If they had created 5 levels and were sedated then death would take them to a level 6 (so to speak) that is limbo. Regardless, limbo defies all the rules established in the movie based on the time spent in level 1 (roughly 1-3 hours). Based on that, a 4th level limbo would only have 2 years existence and if it was equal to level 1 it should have only been 1 week. I don't see anyway using the films rules that the 10 hour sedated flight could produce a 40-60 year limbo. limbo is unconstructed dream space, but that doesn't imply that all unconstructed dream space is limbo. i think that death, and only death, in any level while heavily sedated would take someone to limbo. but i totally agree with the time thing…someone didn't think that through all the way. unless its all a dream made up by cobb and so time doesn't really matter because everything is a dream. but i think thats a lame cop-out explanation. But how do you explain the fact that Saito is clearly older than Cobb when we see him in Limbo? Cobb followed Fischer before Saito died. It would make sense that Saito was older if Cobb only entered limbo once he missed the kick and the fortress blew up. I don't subscribe to the idea that all unconstructed dreamspace is limbo. Everyone enters uncontructed dreamspace when they go to sleep at night. The team need Ariadne to contruct dreamspace to control peoples dreams. Cobb entered Limbo after Saito. Saito died and entered Limbo before the second kick that killed Cobb in the Van. But here's a twist. The revelation in the last 24 hours that the theme music in the opening logos is a slowed down version of “Non, Je Ne Regrette Rien.” (i.e. its the way the Kick music would sound in a time altered level) reveals that the time he entered Limbo was during the playing of the Kick music. But we know he didn't enter during the Kick music on the Van level or the Hotel level. We saw those Kick musical cues play out in each level (except Limbo – no one was in Limbo when the music played). So it's possible that Cobb entered Limbo during the final Kick cue from the airplane. Even though the sedative would wear off, they likely used the Kick cue like in the opening train scene. So then, did Cobb enter Limbo during the last minutes of the sedation when the Kick from the Airplane was playing? I don't know. We have no accounting for where he was during the week in the Van level after we see him die. Interesting stuff and you seem to have got your head around most of the complex stuff in the movie. Can I ask you a question? there is this debate whether the level they go below from the snow fortress after Fischer is shot is a limbo or whether is really another level dreamed by Cobb. If it is a limbo, the only way you can get out from it by dying (after understanding it's not real, of course). So how did Fischer and Adriadne get back to the snow fortress level? If is was another non-limbo level, then Fisher get's one kick at that level from falling effect and the defib used at fortress level the second kick at the upper level; For Ariadne, the kick at 'level 5' is the fall and (assuming she makes the jump some time after throwing Fisher from the building – I need to check this though) – gets the kick from the upper level required when the now fortress is blown off. But if it is was a Limbo, I have the following questions 1.) even after understanding that limbo is not real, if one is killed in limbo, can that person really get out of the (a) limbo, of he/she is still under the effect of a strong sedative (which I think is the case with Ariadne and Fischer) 2.) lets say if it was Limbo, perhaps Cobb and Aridne went there knowing it was not a real place, but not Fisher – so if you were to bring Fischer out of that limbo, before killing him (by throwing from the building so he will spat on the ground and die) he should be convinced that it is not real. But do Cobb and Adriadne do that before throwing him off the building? You could only assume that Fischer and Ariadne knew they were in Limbo (Ariadne makes sense, Fischer not so much) and that the falling didn't kick them, the sudden stop that killed them, did. But at this point, none of the rules established in the universe seem to be followed upon deep analysis. So who knows. Maybe CN can make it make sense in a director's commentary but I'm convinced now that it was all supposed to make sense as you watched (In a dream everything seems real) but wouldn't stand up to real scrutiny (it's only after you wake up that realize something is strange). In one sense, he's demonstrating the power of cinema. In that darkened room you'll allow some suspension of disbelief. But once you walk out and really put your brain to it, everything really falls apart. The level 5 displayed here is incorrect, its not Limbo. That is the 4th level dream, Cobb being the architect of it making it look like his old Limbo state environment. Only Cobb and Satio go to the Limbo state in the movie as you need to die to get there. That's true. That's the only way it makes sense (level 5 not being limbo). Otherwise Cobb and Ariadne would have had to kill themselves to get there (limbo), which they didn't do. That's also why Ariadne and Fisher ended up back in the van (the fall was a kick) while Cobb and Saito woke up in 'reality' (killed in limbo). The question then is how did an unconscious Fisher get to non-limbo level 5? And why did they want to go there anyways? Cobb could have just shot himself to go find Saito and Fisher and Ariadne would have gone back up with the kick explosion. I have a lingering question. How did they move between levels while in a dream. The machine wouldn't technically be 'real'… it would be part of the dream. If you could just dream it why would you then need the machine in the first place? You could just dream going to another level. The machine is for shared dreaming, not just plain dreaming. They needed the machine for them to share the dream within a dream. But the machine wasn't real. Well, dream bullets aren't real either but they still kill you. I think Nolan uses a logic from the Matrix without acknowledging it or drawing attention to it. Namely: Your mind makes it real. You don't need to die to get there unless Cobb was just flat out making up the whole concept of Limbo. Cobb: Don't do that. Don't do that! Eames: He's in agony, I'm waking him up. Cobb: No. It won't wake him up. Cobb: It won't wake him up. Eames: …if we die in a dream we wake up. Yusuf: Not from this. We're too heavily sedated to wake up that way. Eames: Right. So what happens when we die? Cobb: We drop into limbo. Arthur: Just raw, infinite subconscious. Nothing is down there. Except for whatever might have been left behind by anyone sharing the dream who's been trapped there before. Which in our case is just you. Arthur: Let's get him upstairs. Eames: Great… Thank you. So now we are trapped in Fischer's mind battling his own private army and if we get killed we'll be lost in limbo till our brains turn to scrambled egg. Ariadne: When were you in Limbo? Ariadne: The truth that at any minute you might bring a freight train through the wall. The truth that Mal is bursting through your subconscious. And the truth that as we go deeper into Fischer, we're also going deeper into you. And I'm not sure we're going to like what we find. Ariadne: How long were stuck there? Ariadne: Jes.. how could you stand it? Cobb: It wasn't so bad at first, feeling like gods. The problem was knowing that none of it was real. Eventually, it just became impossible for me to live like that. Ariadne: And what about for her? Cobb: She had locked something away. Something deep inside her. A truth that she had once known but she chose to forget. Limbo became her reality. Based on these two sections of dialog, Cobb had been to Limbo and he hadn't died to get there and he wasn't using anything beyond normal Somnacin compound for shared dreaming(or that fact is conveniently and conspicuously omitted). Also, the world that Mal and Cobb created is the only thing that would be in Limbo and that's exactly what we see when Fischer, Cobb and Ariadne go there from the Snow. The level beneath the Snow is Limbo or everything that has been explicitly stated, shown or implied through visuals about Limbo is completely false. Either the level beneath the Snow is Limbo or Limbo doesn't exist at all. hmm…how does that imply that cobb didn't kill himself to get to limbo? maybe he and his wife were playing around in dream space, going deeper and deeper, and thought that killing themselves would take them back to reality, so they tried it, but instead it took them to limbo? Well, for one, he never says they killed themselves. That would be yet another very convenient and conspicuous omission from the expository dialog. Looking at Cobb's motivation in the dialog with Ariadne, he has no reason to omit important facts about Limbo. He's already been revealed to have left out the possibility of Limbo from the team prior to the mission. At this point, he's in a confessional and expository mode. He has no motivation to keep the information from Ariadne at this point. And Nolan has no motive to keep the information from the audience. At some point you go from an unreliable narrator to just making random stuff up throughout the story. the only thing thats holding me back from this theory is how fischer winds up on a terrace in a building that cobb and mal created on a level that wasnt prepared for. so basically fischer gets to the building first before cobb gets to it and that means fischer gets into cobbs subconscious before cobb even gets to that level. Limbo is a shared consciousness, not Cobb's alone. It's there as soon as they all go to dreaming on the plane. What we don't see and have to imply is that Fischer dies by gunshot, wakes on the shore, Mal is waiting for him (since she knows he's coming – she sent him there). Mal overpowers him and takes him to the apartment to wait for Cobb. A level is missing. Reality is only Cobbs at his home before the gang has an Inception on him, and then when whe wakes up free of guilt to see his children.